The Cattachs have won the competition in four of the last five years, with two of those triumphs being part of league and cup doubles. 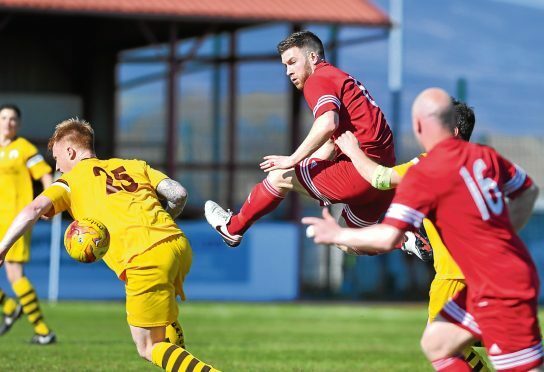 Morrison has been constant throughout Brora’s success, having joined the Sutherland club in 2013 after leaving Caley Thistle, and he is eager to step closer to lifting more silverware by winning tonight’s quarter-final tie against the Scorries. The 28-year-old, who recovered from a torn calf to play 90 minutes in Saturday’s 1-0 win over Rothes, said: “It’s one we always want to win. We want to be the best team in the north of Scotland at our level. There’s no point in chasing the biggest trophy of the season, the league, if we can’t take a bit of time to prove we are the best team in the north of Scotland as well. “It’s good for the boys and for the fans as well because it is a long season. It’s great to have something right at the start to get excited about, and give ourselves the chance of celebrations. Wick are buoyed by Saturday’s fine 2-1 away win against Formartine United however, and manager Tom McKenna hopes to have Michael Steven, Grant Steven, David Allan and Marc MacGregor back in contention this evening. He said: “The guys are on a high at the moment, it’s a happy place and the lads are really looking forward to the game. Nairn County host Forres Mechanics, with Ronnie Sharp looking to avenge for a 4-1 loss to the Can-Cans at Mosset Park on league duty earlier this month. Sharp, who has doubts over Dylan Maclean, Ryan MacDonald (both foot) and Kenny McKenzie (thigh), said: “Forres were too good for us just over a week ago. We know they’re a really good team, they’re a top-five side. Caley Thistle are likely to include some of their first team fringe players when Barry Wilson takes charge of the side that plays Lossiemouth at Grant Park, while Ross County’s reserve team host North Caledonian League side Invergordon at Victoria Park.